J Hardy Carroll grew up in Tucson, Arizona surrounded by silos of Titan II missiles that were never fired. His grandmother died in the room she was born in. His father died in the same room, but was himself born in a hospital. J Hardy lived a good many years in Portland where he worked in bars and wrote humorous pieces about his job for Barfly Magazine. He drew satirical comics for a leftist newspaper and designed websites for independent movies. He got divorced and remarried, raising two girls in the process. J Hardy Carroll moved to Iowa City in 2005 and lived on a farm. He nearly drank himself to death but then he stopped. He had pigs and dogs and a cat. He played drums and wrote poems and created grim animations. He got divorced again. After a while he started writing fiction. 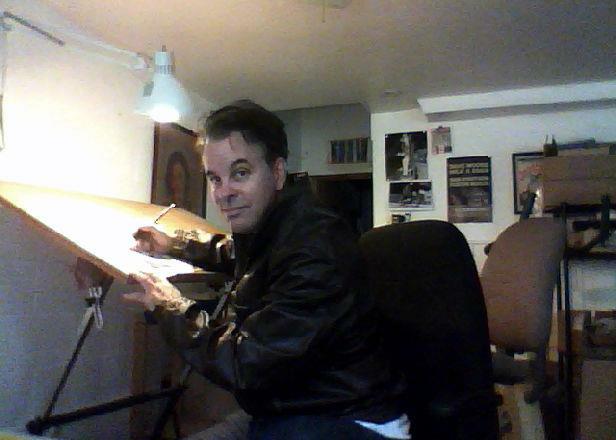 J Hardy Carroll now writes novels and screenplays and the occasional comic. He still writes poems and plays drums. Hi J Hardy, got here through Sunday Photo fiction, got to say that great writing. Plus we got two things in common the writing and that I too almost died from the booze. Found out later on that writing for me is a form of therapy, keeps me focus with a goal in mind. Thanks, Charly. Shoot me a Gmail at jhardycarroll and I’ll send you a copy of my novel. Nice to meet you. I found you via the Pegman challenge. You sound an interesting guy, I look forward to reading more of your posts.